In the office of TOBU TOWER SKYTREE Co.,Ltd., the spokesperson Mochizuki emphasized that the company makes every effort to streamline expenses , which is actually very important so as to spend a large part of the total budget of the Tokyo Sky Tree Development Project -that is about 135 billion yen in total- intensively on just construction work of the Tree itself. The Tokyo Sky Tree project first proposed by NHK and other major five terrestrial broadcasters in Tokyo as the “New Tower Promotion project by six operators in Japan” requiring a new high TV tower of 600 M high in December 2003. 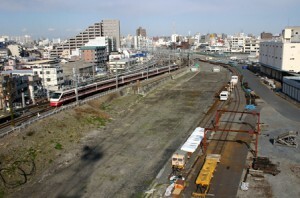 Then, local entities concerned in Sumida-ward Tokyo approached Tobu Railway Co.,Ltd. to ask for cooperation in the bid for the new tower in December 2004. After that, Tobu Railway announced its decision to take part in the project for the new tower to the broadcasting companies and Sumida-ward in February 2005. In March of that year, the broadcasters selected Oshiage area of Sumida-ward as the first choice site and the city planning project was finalized, including rearrangement of town lots, business zones, and urban roads. And four months later in July,the local bidding entities of Sumida and Taito wards got together in launching the ” Sumida-Taito New Tower Bidding Liasion Council” . Then, five months later in December, an approval was given to the founding of the ” Land Readjustment Association (approved to the Project) . In 2006, final decision was made on the site of the new tower in March, ” New Tokyo Tower Co.,Ltd” was established to serve as the operating body of the new tower project in May, and the “Rising East Project” launched to communicate the concept of the joint development project and the new tower as the core element in October. In 2007, public participation was invited for deciding the name of the new tower in October, and the ” City Planning Liaison　Council ” formed consisting of from members from neighboring block associations in November. In 2008, the City Planning was finalized (changes in use of districts, district planning, etc. ) in March, the new tower was named ” Tokyo Sky Tree” by nationwide vote, the company’s name was revised to ” Tobu Skytree Co., ltd.” in June, and the construction kicked off in July. In February 2009, the color designed was finalized, and in October, the lighting design for Tokyo Sky Tree was finalized and the planned height of Tokyo Sky Tree was finalized to be 634 M.
The construction started in July 2008. The construction is scheduled to be completed in December 2011. 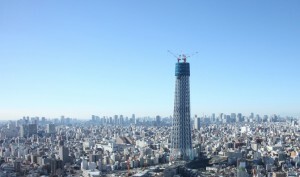 And Tokyo Sky Tree will have its grand opening in spring 2012. As all the current analog broadcasting services are going to terminate on Jul. 24 2011 and will be all replaced by the terrestrial digital broadcasting services completely, our society need a new TV tower which is supposed to better serve the upcoming higher and larger demands of services than the current ones. That was why major broadcasters first proposed a project of building a new TV tower. And the reason why this Oshiage area in Sumida-ward succeeded in at the bidding is also significant. 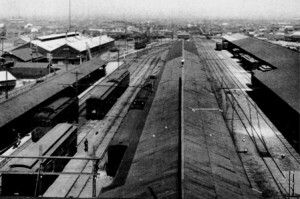 As written before, the local chamber of commerce and industry, local neighboring associations all got together to invite the project to the area and approached Tobu Railway. Therefore, there have been no protest movements or troubles with the Project at all, and Tobu Railway and its group have kept very good relationships with the local Council and local people. What is more, Tobu Tower Skytree Co., incorporated specifically for the construction and management of the new tower by Tobu group has hosted a regular meeting of the “City Planning Liaison Council ” once a month, which has chairpersons of 29 neighboring block associations as its members, in order to exchange opinions and keep close mutual trust and understanding. 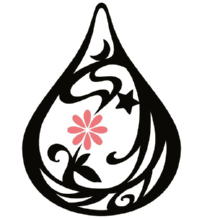 This is because Tobu has the basic concept of simultaneous prosperous developments of both the new tower itself and the local area as a whole. 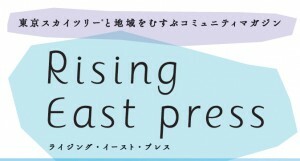 In that concept this “Rising East Project” contains multiple meanings; firstly, that project takes place in Japan which is located in the East of the world, secondly, it takes places in Tokyo which is located in the East Area of Japan, and thirdly, it takes place in the eastern area of Tokyo. Sumida and Taito ward are in eastern area of Tokyo, which has a significant sense with that huge project to realize.